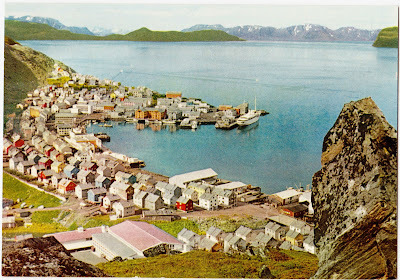 The coastal city of Hammerfest, Norway, was established in 1838 and now boasts a population of just under 10,000. It is one of the northernmost cities in the world, putting it on a list alongside such settlements as Longyearbyen, Norway; Khatanga, Russia; Tiksi, Russia; and Barrow, Alaska. Hammerfest is considered to be one of the great locations for checking out the full majesty of the Northern Lights. These small photo cards, produced by Aune, appear to date to the 1950s or early 1960s. They measure about 3⅞ inches by 2⅝ inches. Above: A view of Hammerfest from above. 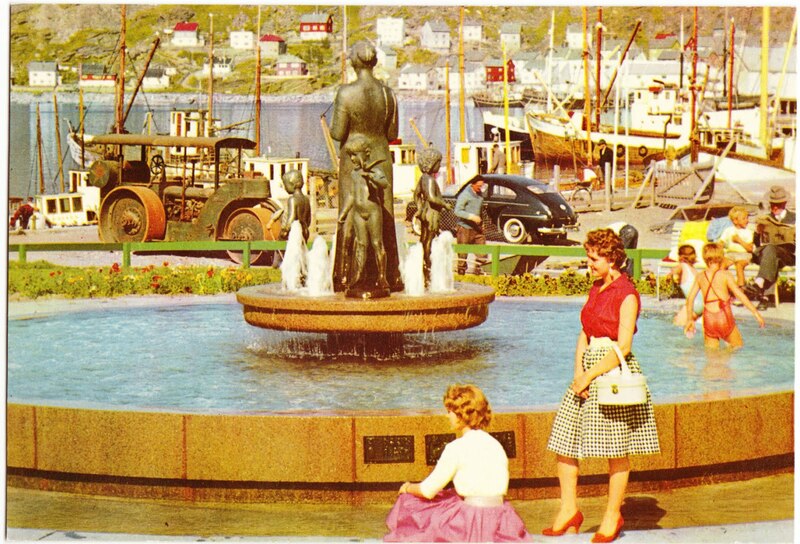 Above: Tourists check out the fountain in the harbor area. 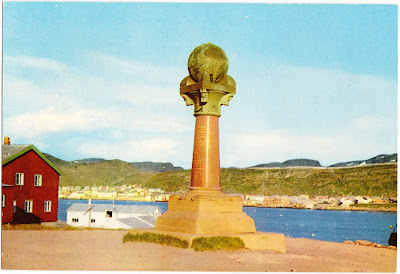 Above: This is the Meridian Statue, which is located at the site of the Fuglenes Lighthouse in Hammerfest. The statue is a key component of the Struve Geodetic Arc, a 19th century effort to accurately measure a meridian. Read more about it at Wikipedia, Northern Norway and Travel.MapsofWorld.com. Above: Locals (who appear to be Sami, judging by their clothing) relax on a hillside while the cruise ship Stella Polaris travels through harbor. 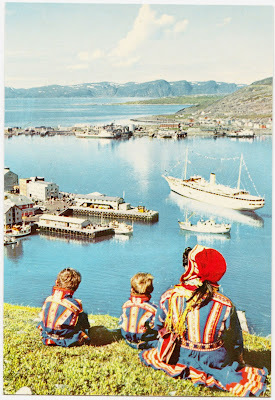 (For a comprehensive history of the Stella Polaris, check out CruiseLineHistory.com.